Discussion in 'Backpacking' started by curtiseddie, May 8, 2018. Crocs or Mocs. I decided a long time ago I’d rather have a Hugh Glass moment than to ever put on flip flops. Guttersnipe, BalsamFur and NevadaBlue like this. I would avoid flip flops. I don't like the thong between my toes. Also a fellow camper broke his toe going to the showers while wearing flip flops. Kinda ruined the next day for him. I use boats shoes/topsiders. Easy on and off, a little more protection from rocks and roots. For me I like a closed toe shoe in the woods..
Guttersnipe and NevadaBlue like this. I use the think the same thing, but have found it's more about how you walk than where you walk. We do distance backpacking and despite being a gram-Nazi, I pack along a pair of Xero Shoe sandals that weight 8.7oz as a pair; the lightest I could find. Now, these are minimalist footwear and you need to understand the dynamics and pay more attention to where you walk. I'm convinced heavy hiking boots have made us ignorant to where and how we walk; that creates the fear of using sandals. While I don't like the string-toe version as much as the "across-foot strap" version, for summer they're lighter. After trekking all day and if your feet are wet, these are much appreciated to setup camp and work a little allowing your feet to air out. I've hiked in jungles, deserts, swamps, and a rainforest with minimalist sandals. I've never had an issue and there's more mental fear of exposed feet than the reality once you overcome that fear. I won't go so far as to go truly barefoot, but even the slimmest of footbeds makes a world of difference. backlasher, vincere, UAHiker and 1 other person like this. I wear Chacos mostly but I do have some of these Bedrocks and they are very ligt. vincere, Glock Holiday and Guttersnipe like this. Zero Shoes DIY sandal kit!!! I have one of my old Subaru tires in my garage that I've been saving for making a pair but I haven't got to it yet. I want to see some of you guys make your own!!! These are my late May thru mid S ept. woods and water shoes, cheap +- $10.00 Ozark Trail from Walmart and spend at least half their time submerged in lakes, streams and rivers fishing/canoeing/sailing so I need closed toe protection. Only 1 repair in 4 years with Gorilla glue to back heel strap to sole (top shoe pic)) 2 years ago. Lonewalker, Bennieboo, Guttersnipe and 1 other person like this. I also wear bedrock sandals. Been wearing these for about 6 months now. Like mentioned above, it takes a bit to get used to how feet should feel, but I love them. I really only hike in these now. I picked up MRSA in Ecuador in 2016 and lost my large left toe as a result of the infection. So flip-flop type sandals won't work for me, but Teva sandals work well , especially when I add some medium weight wool hiking socks (Smartwool, or current favorite Keen Targhee socks). If you need something lighter,try slipper socks- socks with two layers 0f leather moccassin soles. I believe Acorn makes slipper socks. Chacos for most everything. Maybe not for seventy pound packs or trailblazing through manzanita but the custom pairs on their website can be built with vibram hiking boot outer soles and have plenty of support. 50+ Miles of trail hiking and backpacking in the last few months on this pair and haven’t noticed a difference in performance between my heavy leather hiking boots, other than my feet not sweating and stinking up the tent. Guttersnipe and Glock Holiday like this. My personal favorite, especially after long hikes or runs is a pair of thick winter socks and Tevas. I literally have had nothing on my feet for the past three years except hiking boots and Birkenstocks (except for on Yom Kippur) and have long been a proponent of Birks for camp wear. But I’ve decided getting leaves and duff in my sandals when sitting cross legged on my z-seat in the woods is getting tiresome. Regular Crocs are too bulky for me... too bulky in the pack. But after a lot of Googling and thinking and trying stuff I came across the Crocs Santa Cruz. Haven’t been able to test them as camp shoes / apres hike shoes yet... that will either be next weekend or the weekend of 11/10. Very light weight. My size 43 Milano Birks — which I consider a light shoe — are 1lb 4.2 oz on my scale. The size 10 Crocs are 14.4 oz. They pack down very flat. Looks like they will dry quickly. Very comfy. The insoles have this nubby bump pattern that kind of gives you a light tingly foot massage sensation when you walk. Might be delightful after pulling off boots after a day of hard trail hiking. They were considerably cheaper at Academy Sports than the $54 list shown... $30 I think. To those of you who bring along footwear to use around camp, what is your choice? I tried Crocs once, which are effective for water crossings and pretty comfortable, but i have found them way too bulky. I now typically bring flip-flops. They are lightweight and slim for packing. My conflict comes from middle of the night bathroom breaks during cold temps. I am usually wearing socks and those don't work with flip-flops. (use as a secondary shoe for water crossing is not a consideration anymore. I prefer going barefoot, no matter the temps, because I find I'm more surefooted). I use crocs. They are bulky, but I just keep them strapped to the outside of the pack. A new pair of crocs, IMHO, is a great water crossing shoe. Add me to the list of Crocs fans too. I have the Coast version with less holes around the toe, to keep my socks a little drier in camp. Totally worth the weight! I wear my eastern woodland Mocs or my ligioner Mocs. Metaldog and NYWanderer like this. 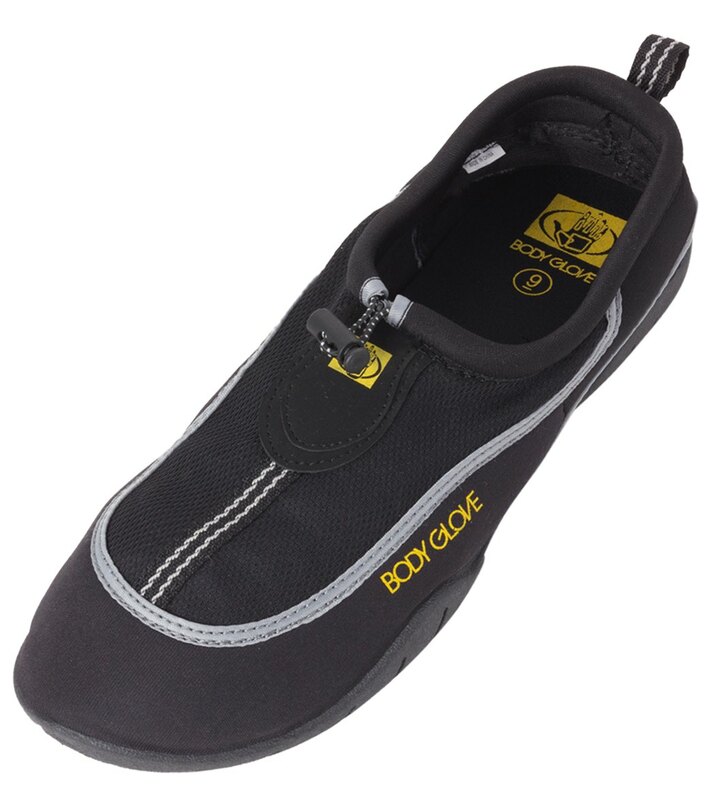 I use a set of Body Glove shoes for water crossing and midnight breaks. They slip on with socks and are great around camp. Got them for $9 a pair. NYWanderer and NevadaBlue like this. So this was picked up from Shug Emory on Youtube. Take a pair of boot insoles and use Gorilla Tape for straps to the bottom of the insole. Obviously you need more tape or cloth of some type to double over where the adhesive would contact you skin or sock. Perhaps use 2" tape and cut an end section of 1" and fold the tape in half lengthwise. Makes a lightweight slideon for midnight cooling break. Does anyone have a good suggestion for camp shoes that double as shower shoes (call me paranoid, but I refuse to go barefoot in campground showers)? I leave a pair of old clogs at my camp.They're comfortable and easy to slip on when I gotta get up to relieve myself in the middle of the night.Lot more comfortable than wearing my boots the whole time. Try water shoes.They're used for boating,walking on the beach,and more. Chacos for this guy. Been good to me in all sorts of different scenarios and uses - maybe better options out there for others but for me these have worked and held up great. If I were to try something different I'd probably give Keen a look. Crusher0032 and beestokk like this. I have a couple pair also. Love wearing them on the river. Im a crocs fan. Easy to clean, comfortable, and they float. Keen makes great water and beach shooes. We bought some on sale at REI at least 10 years ago. They are great for camp showers, light hiking, beach/river/lake use. They range from $40-$130. We got ours for $20 on sale. They are very durable and long lasting. I wear the Off Road Crocs pretty much all the time hiking walking mountains to swamps, I work in them and hunt in them. The first two trips hiking on AT I carried my Teva sandals as spare just in case, crocs proved worthy no more tevas. They are not fir all but perfect for me, years of battles with plantar facitis since change my feet are ugly n rough but strong and functional. Yes , no socks. beestokk and Mojoe like this. Cheap Walmart boat shoes. Find a lightweight style (nylon mesh upper, rubber sole) and rock them until they fall apart. Last pair was $4 on closeout at end of summer. Yeah, the oldest most worn house slippers I have. The Classic House Moc - complete with faux shearling liner, all matted down, with lots of dog hair thrown in. As often as I go in and out of my tent, they are easiest to kick off on the way in. I hate Crocs and any form of flip flop, the latter because they...um, flip flop. Can't keep them on my feet. Any type of camp chore has them slip off or sliding out from under my heel or just going in a direction I ain't. I really want to make a pair of moccasins with thick soles, just for use in camp. I had a pair of moose mocs years ago that were great - soft, but thick and tough. So there is a lot to be said for all of the very comfy sandals and moccisans you folks have recomended but personally i carry 2 types of footwear with the type depending upon what im doing. A good pair of hiking shoes for travel and a nice sturdy pair of leather boots for at the camp. I believe you see a theme developing here. I firmly believe you should wear good tough leather boots at camp because firstly your your doing camp chores....gathering wood or stones for a pit or timbers for a shelter ....all of which while not super heavy are collected with metal tools like an axe shovel or saw. Secondly, your working around fire ...i dont think i have to elaborate on that one. I always keep a clean dry pair of socks with my boots amd after i get where im going i take the time to change into my nice dry camp clothes and that includes socks and boots. Be smart....take care of your feet ....they are totally underrated and if you think about they are the most important piece of gear you will ever own.